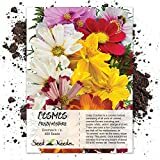 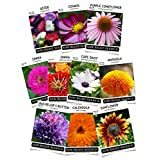 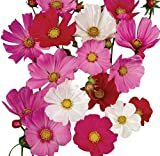 Cosmos Flowers Seed (Cosmos Dwarf Sensation Mix )1000 Seed - Covers 200 Sq.ft. 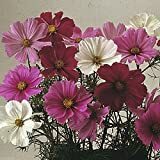 Cosmos plants for sale – Easy plant to grow, mostly grown for the ornamental flowers and for the leaves, planting season in spring to autumn and as annual plant in the spring, better to buy plant or another option to start from seeds yet more challenging. 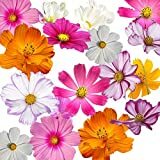 Blooming in the spring to autumn in daisy shaped flowers that appear in pink, yellow, orange, white, purple or multicolor.